The ship joined the Windjammer family in 1969 and underwent a $6 million renovation. The Ship and the Storm explores every facet of this tragic story. Was the ship seaworthy? 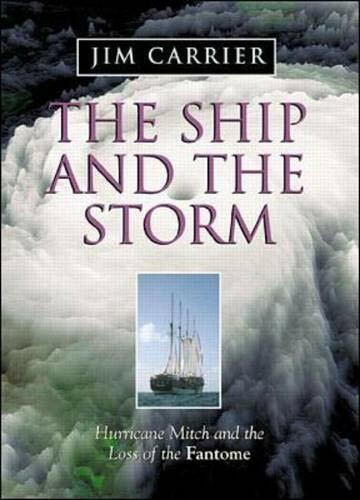 Why did the captain put to sea with the storm approaching? What happened in the eye wall of the worst hurricane in 200 years? This riveting real-life drama is forensic journalism at its finest, taking us from the deck of the ship, to cruise company headquarters in Miami, to the National Hurricane Center. From Jim Carrier's extensive on-site research and hundreds of hours of interviews emerges a story of hubris, courage, and the power of nature. In October 1998, as March and his crew--most of them West Indians and most still in their twenties--neared the end of another cruise season, Tropical Storm Mitch whirled to life like a nebula in the southern reaches of the Caribbean. While hurricane specialists in Miami struggled to decipher satellite photos and conflicting readings, Mitch moved north, then west, ultimately growing into the fourth most powerful Atlantic storm on record as it plowed toward the Gulf of Honduras. After discharging his 97 passengers in Belize, Captain March--with First Mate "Brasso" Frederick, Second Mate Onassis Reyes, and twenty-eight other crew--took the $20 million uninsured ship to sea to try to dodge the approaching storm.